Before the East India Company waltzed in, the island of Penang was uninhabited. But it very quickly became a bustling trade port centred around Georgetown. While the old port and the area's history as one of the region's great cultural melting pots is fascinating, most travellers are here for the beautiful beaches and peaceful beach resorts. And for the food. Recommending the best places to stay in Penang is highly dependent on why you're visiting, but you can choose from everything from city style to barefoot luxury. Georgetown has been World Heritage Listed because of its beautiful colonial and pre-WWII houses and shopfronts, its notable temples and churches. It faces the mainland across a narrow straight. The far side of the island, to the west, is relatively undeveloped, dotted with smaller villages, orchards and padi fields. Most of the island's cultural attractions are around Georgetown. There's Kek Lok Si-Temple, a vast Buddhist temple complex, several botanical gardens, a Butterfly Farm and several museums. Penang is a great place to be come festival time as well - and there are numerous festivals each year. If you're here for the beaches though, you'll be more interested in Batu Ferringhi, which has some of the island's whitest, sandiest beaches, Teluk Bahang, a quiet fishing village to the island's north, or Tanjung Bungah, which is where you'll find many of the larger resorts, between Batu Ferringhi and Georgetown. If you want to do more than just relax, there's plenty of opportunity for watersports, including snorkelling and sailing and there are two golf courses. If you want to explore the island you have a choice of walking of hiring a bike. And then there's the food… There are countless food stalls, as well as restaurants and cafes, and Penang is known for the originality and diversity of its dishes. So don't be afraid to try what the locals are having. Unwind on beautiful stretches of powder white sand beaches. Wander through the colourful streets of Old Georgetown lined with traditional and colonial buildings. Trek through the botanical gardens to the top of Penang Hill. Visit the intricately designed Dharmikarama Burmese Temple. Feast on the delectable street food stalls. With such a variety on offer this is a popular place. Many of the best places in Penang are snapped up quickly so do make plans and book early. Campbell Hotel is a charming renovation over an old shop on one of Georgetown's most interesting streets. The decor is a great blend of the traditional and contemporary classic styling. And there's a chic little Venetian restaurant. Muntri Mews in Georgetown is a great little five room traditional hotel with four poster beds and terraces overlooking a charming little garden. Starting from just £55 per night. The Straits Collection is a collection of shopfronts converted into one or two room apartments, decorated with some lovely local antiques. There's a communal restaurant and bar on the same street. Rooms start from £97 and offer great value and space for families. Clove Hall is a gorgeous colonial townhouse in central Georgetown. Romantic boutique rooms have white washed walls, four poster beds, antique furniture and lots of space. The attractive garden, terrace and pool area are a bonus. Georgetown's Hotel Penaga is a stunning looking hotel with both sleek, geometric lines and a smattering of local style. Well located for some of the major sights, this is a stylish place to stay and see the city. Seven Terraces is a gorgeous six bedroom, boutique bolt hole in Georgetown's colonial district. Romantic and beautiful with French and Malaysian restaurants. Macalister Mansion is a modern residence in the heart of old Georgetown. Stunning contemporary suites, some in the turrets, with all the mod cons, pale furnishings, and lots of space. A grown up spot for the design conscious. Chymes in Tanjung Bungah is a great option for those on a budget, a collection of charming, bright little rooms with all the mod. cons. but not too much else. You're a short stroll from the beach and close to a number of decent restaurants. 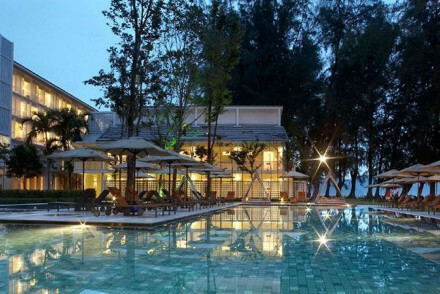 The Lone Pine Hotel near Batu Ferringhi is a smart beachside hotel with an enormous pool! 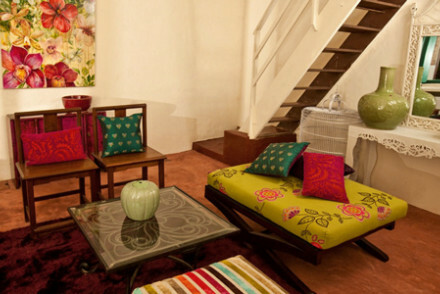 Expect all mod cons., sophistication and great facilities for all the family. If you've decided that a self catering property would be more suitable for your holiday, then we recommend you visit our onine booking partner Booking.com where they have a wide selection for all tastes and budgets. Fly to Penang Bayan Lepas International Airport, located 30 minutes from George Town and well located across Malaysia and Internationally. Best time to visit - Penang is a year-round destination with temperatures averaging between 24°C - 32°C. The months November - January linger on the cooler end of the scale and make sight seeing more comfortable. 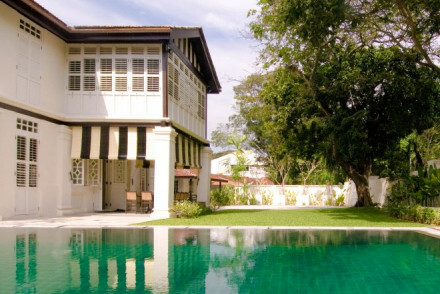 Browse though our list of all the best places to stay in Penang. Consider our Guru's list of the best places to stay in Kuala Lumpur. Expand your search to the best places to stay in Malaysia. A fantastic option for those on a budget. Charming little rooms, brightly decorated and with all the mod cons, including DVD players. No restaurant, but walking distance to the beach and all the amenities. Perfect for families wanting a low key beach holiday. Sights nearby - Floating Mosque of Tanjung Bungah. An excellent value chic boutique in old Georgetown. 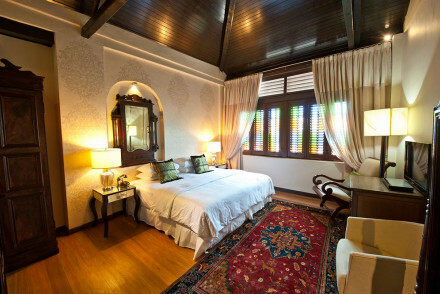 Charming rooms have traditional elements, four poster beds, soft fabrics and teak balconies overlooking the garden. Lovely little cafe and close to the beach and attractions. Perfect for those on a budget. Sights nearby - Chinese clan house, an Indian temple, and a Muslim mosque. A wonderfully renovated shop corner house on one of Georgetown's most interesting streets. Smart boutique rooms blend traditional elements with contemporary classic design. 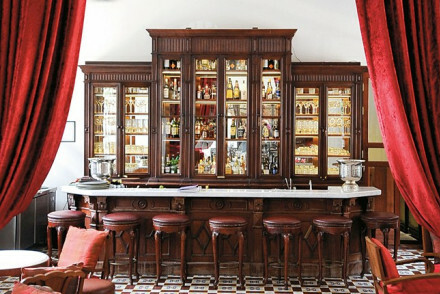 Incredibly chic Venetian restaurant. A real gem with lots of character. Sights nearby - Leong San Tong Khoo Kongsi, Pinang Peranakan Mansion, Clan Jetty and Fort Cornwallis. A stunning hotel that combines designer flair with boutique tradition. Gorgeous rooms and suites have four poster beds, sleek lines, geometric spaces, but at the same time lots of authentic decoration. Excellent fusion restaurant. A great way to visit the city in style. Sights nearby - Waterfall Gardens, Penang Botanical Gardens, on Jalan Air Terjun for green spaces. Local markets - Chowrasta Wet Market. A charming collection of converted shophouses with one to two rooms, sitting rooms, DVD players and a communal restaurant and bar on the same street. Lots of antiques and well worn furnishings. Excellent value, perfect for families. Views - Excellent views from Penang Hill, a classic colonial hill station straight out of Somerset Maugham. Value chic - Rock bottom prices. Sights nearby - Georgetown is a Unesco World Heritage sight so there are many attractions. 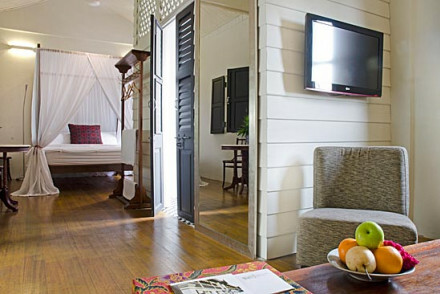 A gorgeous boutique bolthole in Penang's colonial quarter. Romantic chic suites have lots of space, hand carved four poster beds, soft furnishings, and balconies on to a beautiful courtyard. Fantastic little fusion restaurant, garden and pool. Bags of character. 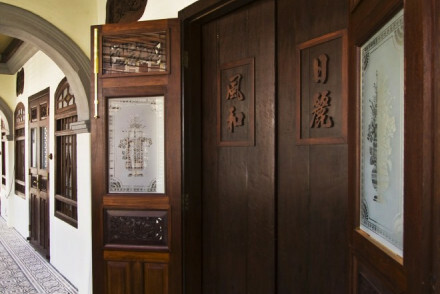 Foodies - The restaurant combines Peranakan heritage with French techniques. Lively - Set in a lively area of the colonial district. A gorgeous colonial townhouse in central Georgetown. Romantic boutique rooms have white washed walls, four poster beds, antique furniture, and lots of space. An attractive garden, terrace and pool area. An outstanding guesthouse at an excellent price, family friendly and romantic. Local markets - Clove Hall can arrange a guided tour for you to take you to all the local markets. Sights nearby - Penang is a Unesco World Heritage Site so there's lots to explore. A modern residence in the heart of old Georgetown. Stunningly contemporary suites, some in the turrets, with all the mod cons, pale furnishings, and lots of space. Excellent innovative cuisine, billiards room, and mosaic tiled swimming pool. A grown up spot for the design conscious. Sights nearby - Penang Botanic Gardens. A very smart beachside hotel with an enormous pool. 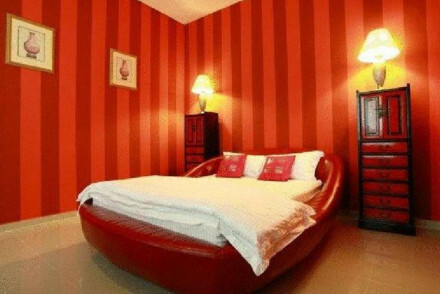 Sophisticated rooms and suites with all the mod cons including DVD players, private balconies and enormous bath tubs. Excellent spa, Japanese restaurant, and facilities for children. Great for families. Sights nearby - Tropical Spice Garden, Floating Mosque of Tanjung Bungah.